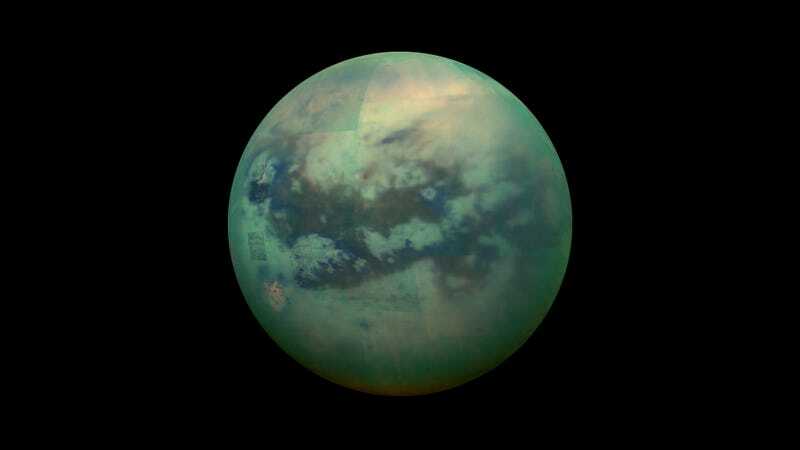 Saturn’s largest moon, Titan, is kind of like what you’d expect if Salvador Dali designed a planet. It has methane lakes, electrically charged sand, and allegedly, an ocean hiding under its crust. While the Cassini and Huygens spacecraft have revealed some of these mysteries to us, so many lingering questions about this weirdo moon remain. Recently, a team of researchers at Johns Hopkins Applied Physics Laboratory (APL) proposed a probe they believe can tackle Titan’s many oddities. It’s a dual-quadcopter called “Dragonfly,” which would sample the surface and atmosphere of the moon at various locations using mass spectrometry, gamma ray spectrometry, and more. It’s also pretty cute to think about a copter hopping around an alien moon like a dragonfly. Since Titan has an unusually thick (read: thicc) orange atmosphere, there would be lots of delicious nitrogen for Dragonfly to sift through. The team proposes it would also traverse the moon’s surface for chemical signatures of water or hydrocarbon-based life. Titan has a methane cycle similar to Earth’s water cycle—except with, you know, methane—so that should make for some interesting chemical signatures of life, should there be any. The next step for Dragonfly is a bit of a waiting game. The proposal will be considered among NASA’s New Frontiers mission candidates. Later this year, the space agency will choose a few concepts to study further, but will ultimately choose just one for the planetary exploration program. According to APL, that decision won’t be made until mid-2019. Dragonfly’s team has already had some success flying around test versions of the real thing—and landing it with tennis ball legs. While this won’t fly on Titan, it’ll be exciting to see how the team shapes up its intrepid probe over the next few years.